On Thursday, 7 June, at the Parnassos Literary Society in Athens, Alexandros Kyriakopoulos gave a piano recital honouring the memory of Nicola David-Pinedo. On the same grand stage where Maria Callas once sang and Yiannis Ritsos and Georgios Seferis recited their poems, young Kytherian pianist Alexandros Kyriakopoulos interpreted the works of Johann Sebastian Bach, Franz Liszt, Ludwig van Beethoven, Claude Debussy, Sergei Rachmaninoff and Frederic Chopin to a packed to capacity audience. The evening was also dedicated to the launch of Aurora created to celebrate the life and memory of Nicola David-Pinedo. Undergoing treatment for leukemia, during her bone marrow transplant follow-up in Athens, Nicola witnessed the pressing needs facing patients and their families. Together with her husband Clemente, Nicola envisaged an organization that would support patients through this traumatic time. Nicola is thus the inspiration for Aurora – and her vision has now come to fruition through an organization that will help support patients and their families, and that is also committed to the fight against hematological diseases. Alexandros Kyriakopoulos was born in Athens, but grew up on Kythera where he attended the three-teacher Primary School of Karvounades. Seventeen years later, he is a graduate with a bilingual International Baccalaureate (IB). 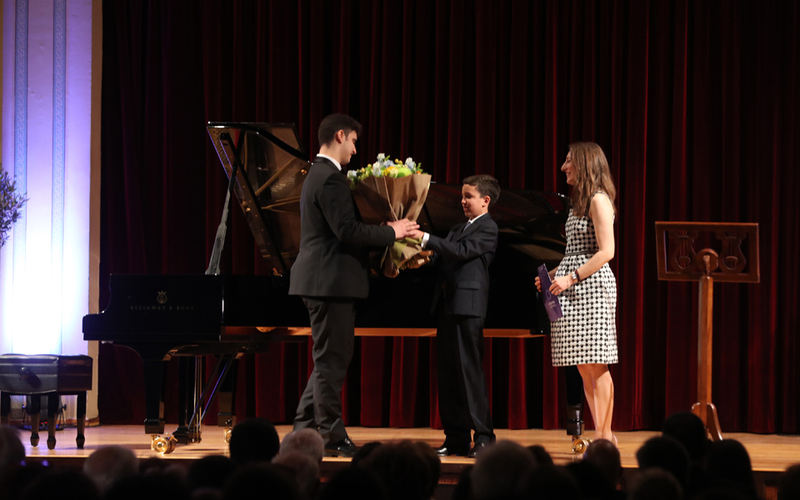 Alexandros began piano lessons at the age of five with piano teacher Eleni Kokolaki. One year later, he began a complete cycle of musical studies at the Anagennisi music school on Kythera. His rapid and successful development compelled him to continue his efforts in Athens. He became a regular student of the Department of Harmonization of the School of Higher Theoretical Studies with Fotis Pappas while attending chamber music lessons with Antonis Manias at the Anagennisi Conservatory in Aegaleo. He continued his music theory studies of Counterpoint with Giorgos Minas. In January 2016 he was awarded a Harmony Degree with Distinction and in the same year he received a Distinction for Grade 8 piano in the Royal College of Music examination. In the same year he also participated in a Master Class at the Thessaloniki Piano Festival. Alexandros’ piano instruction – after his departure from Kythera – continued in Athens with Neville Jason Fahy and Dr Alla Halapsi. For the past three years he has been studying piano with distinguished musician, conductor and pedagoue Dimitris Toufexis. Alexandros has also participated as an active member in piano and concerto recital in Athens, Karditsa and Thessaloniki. The development and progress of Alexandros in the sensitive and disciplined domain of Music reveals a highly endowed youth with the potential to develp into an accomplished and successful artist. Aurora is a charity dedicated to helping those with leukemia, lymphoma and related blood disorders to fight the disease and achieve a better quality of life. Our mission is to make leukemia and other hematological diseases 100% curable. Until that can be realized, Aurora aims to: improve care for patients; offer support to their families; increase the patient survival rate; support specialized medical centres; and promote the development of research in the field of onco-hematology.